Pine & Pike Streets, originally uploaded by Gordon Werner. 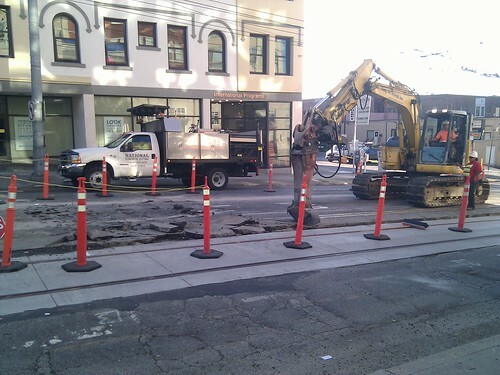 As streetcar construction begins ripping up the Broadway pavement between Pike and Pine following the initial work in front of Seattle Central, here’s an update on the project — and the future of fixed-rail mobility in the central city’s core. Weekdays 7:00 a.m. – 4:00 p.m.
Saturday 7:00 a.m. – 7:00 p.m. Loud impact work under a noise variance, including concrete breaking, may begin at 8:00 a.m.
Today Mayor Mike McGinn announced that the Seattle Department of Transportation (SDOT) has selected NelsonNygaard to move forward with planning work on the City Center Connector, a high-performance high-capacity transit corridor identified in Seattle’s Transit Master Plan recently adopted by the City Council. SDOT will now begin contract negotiations with NelsonNygaard with the goal of having them at work on the City Center Connector within a few weeks. The city says public outreach will begin in October with stakeholders and continue over the 12 to 18-month life of the project. “A final draft plan for the best transit technology and street pathway through the Center City will be completed by the end of 2013,” the announcement concludes. If you missed it, there is now a plan to make a plan for the extension of the First Hill streetcar farther north on Broadway to Aloha. My prediction is that there are enough No Streetcar voices on 4th/5th that the loud and constant drumbeat for a First Ave Streetcar from the PDA and Belltown will make it happen there. The city will say to dejected wonks “we might still do it, promise!” and never do it at all.